AMERICUS, GA (WALB) - Four suspects have been charged following an Americus shooting that injured two people, according to the Americus Police Department (APD). 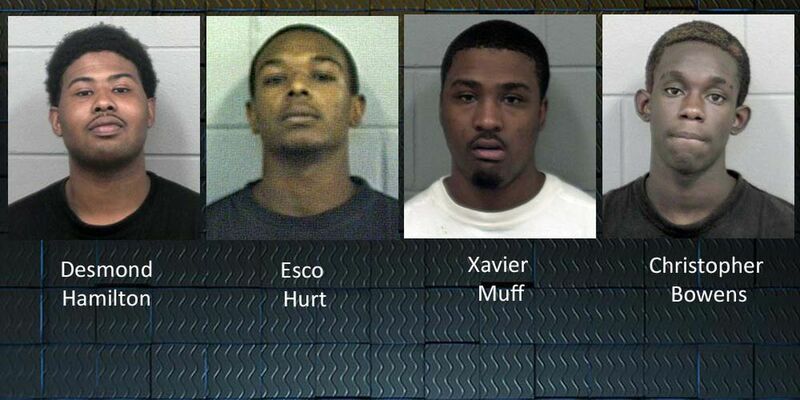 Xavier Muff, 24, Desmond Cortez Hamilton, 24, Christopher Julius Brown, 24, and Esco Mel Hurt, 28, all of Americus, were arrested in connection to the April 10 shooting incident. Hurt was injured in the incident and treated and released from Phoebe Sumter Medical Center, according to APD. Additional charges are pending on those in custody and more arrests are expected, APD officials said. Anyone with information is asked to call the Americus Police Department at (229) 937-9011 or the Georgia Bureau of Investigation at (229) 931-2439.